Next month, the tiny Mediterranean island of Malta roars to the sound of hundreds of pre-1976 vintage cars zooming around the roads. It is the four-day Malta Classic, which is part sponsored, for the fourth year, by Corinthia Palace Hotel & Spa. Vintage Ferraris, Alfa Romeos and Aston Martins take on tight bends, sweeping curves and inclines through valleys, vineyards and terraced hills to test both the drivers and their classic cars. The Malta Classic will take place this year between October 10-14 and will comprise three events: the Malta Classic Hill Climb by Thomas Smith on October 11, the Malta Classic Concours d’Elegance by Mdina Glass on October 12, and the Malta Class Grand Prix by Chopard on October 13-14. Drivers are drawn to the event from all over the world. Blasco Montanel Antoine, from France will bring his Osca Maserati, while the Malta contingent will include Steven Collins in his 1956 AC Bristol and Dominique Baldy in his 1930 Bugatti Type 35B Grand Prix. 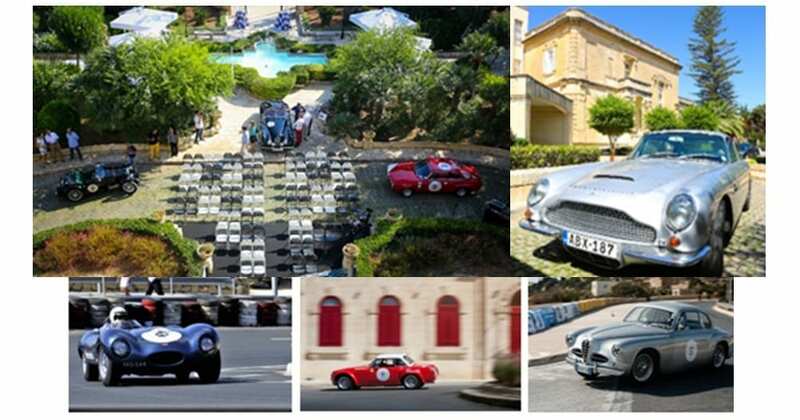 The luxurious Corinthia Palace Hotel & Spa, a property that shares the same elegant and classic lines as the vintage cars, will play host to many of the Malta Classic teams during the event. The hotel opened in 1962 as one of the island’s first upmarket restaurants. A few years later an adjoining hotel was built in the property’s extensive grounds and this was the start of what has become a global collection of luxury, five-star hotels, named after the iconic Corinthian columns of the original restaurant.